All transactions are safe and secure with a reliable history in online purchasing behind each of our associates. Buy the Stencil Rambo t-shirt to own Rambo clothing and merchandise. Help Sylvester Stallone fight the evil sheriff in one of these First Blood Rambo shirts. 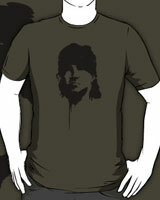 The front of the tee displays a stencil image of John J. Rambo. Draw first blood with John and help him take on Sheriff Teasle and his deputies, including Deputy Mitch (a young David Caruso). In the design, he appears to be watching his enemies, waiting to strike. After all, they drew first blood, not him. Order this tee to match your First Blood movie poster art. Get one of these affordable Rambo t-shirts today. In addition to the Stencil Rambo tee above, browse the Rambo Clothing Gallery for more apparel like men's and women's clothes, kids shirts or hoodies.